Hi everyone. I had a very productive day on Saturday, enabling me to finish my latest piece! I have been painting a picture of a wonderful pub in London, in Victoria Street, near Westminster. As soon as I saw the pub I knew it was perfect to paint. 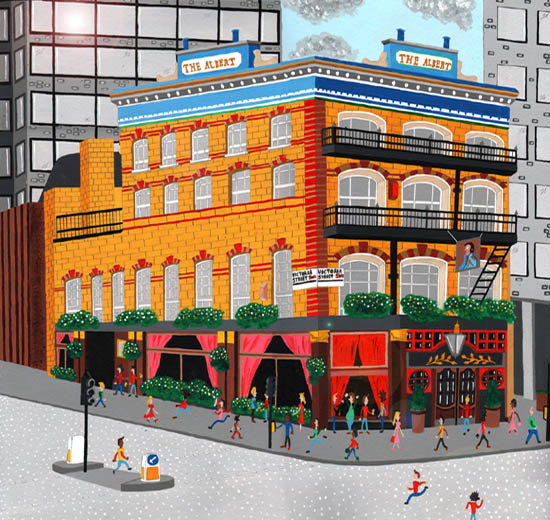 The colours of the pub would make it stand out anywhere, but with it being sandwiched between grey and dreary office blocks just make it shine bright. Amongst the pub are my usual little array of people, all going about their daily business. I’ve had huge amounts of fun painting this. Remember, the painting and also limited edition prints are available to buy at the link below. As always, comments are welcome!